Director of Opera Theatre at the University of Minnesota School of Music, and a native of Toronto, Canada, David Walsh graduated with Honors in Political Science and Economics before studying Theatre Science at the University of Toronto. Professionally, he has worked for Scottish Opera, English National Opera, Paris Opera, Royal Opera Covent Garden, Netherlands Opera, Opera National de Lyon, Israeli Opera, Frankfurt Opera and Deutsche Oper am Rhein, Düsseldorf, among others. 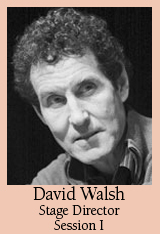 From 1984 to 1987, Mr. Walsh served as Assistant Artistic Director to Brian McMaster with Vancouver Opera. Mr. Walsh held the post of Head of Production for Scottish Opera from 1987-1991.